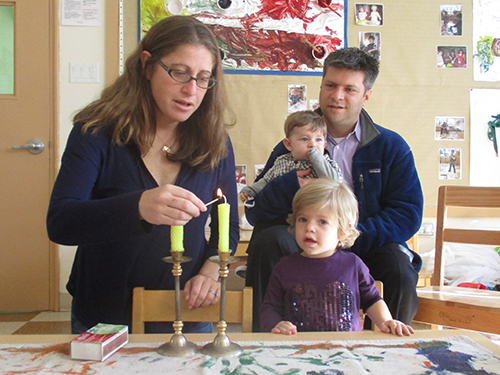 At Stephen Wise Free Synagogue's Early Childhood Center, play is at the heart of learning. Our stimulating programs for children ages 12 months through five years provide a nurturing environment, infused with Jewish values and rituals. Located on Manhattan's Upper West Side, the ECC began as the synagogue’s Nursery School and Kindergarten in 1949. Values of progressive education, creative play-based experiences, and building a strong Jewish identity have always been central to our educational mission. We remain true to these core traditions, responsive to the changing needs of families, and committed to innovation and excellence. Our philosophy is based on the world-renowned schools of Reggio Emilia, Italy, which value children as capable, strong, and rich with wonder and knowledge. We believe in a constructivist, play-based approach to education. Through play, our children are empowered to explore their surroundings, form relationships with teachers and peers, and work with a wide variety of materials to create, experiment, and discover. Our children learn in meaningful contexts, using everyday moments as opportunities for growth and learning. Explore our programs, schedule a tour, or contact us to learn more. Experience the wonder and magic of our Early Childhood Center at summer camp. In Macaroni Kid Upper West Side, our Early Childhood Center Director Miriam Kalmar shares expert advice for building independence in young children.